23 people ran the handicap today, which was renamed the Horton handicap, in tribute to John Horton who ran his last handicap as an OS employee, after 41 years service, although he has promised to continue to visit for running events in the future. The cheering and support at the finish was really great, especially for those of us who were a bit further down the field and got the full ‘wall of noise’, as we approached the finish line. 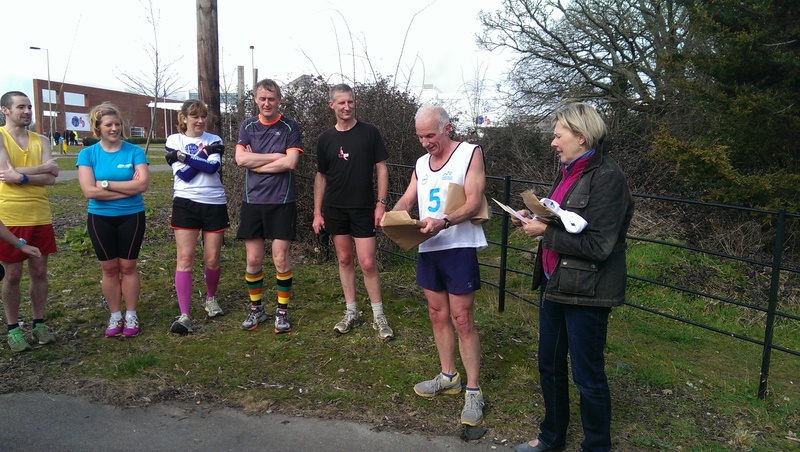 Afterwards we were treated to a brief synopsis of John Horton’s time at Ordnance Survey by Mark Stileman before the presentation of the gifts and card that members of the running club had purchased for John. 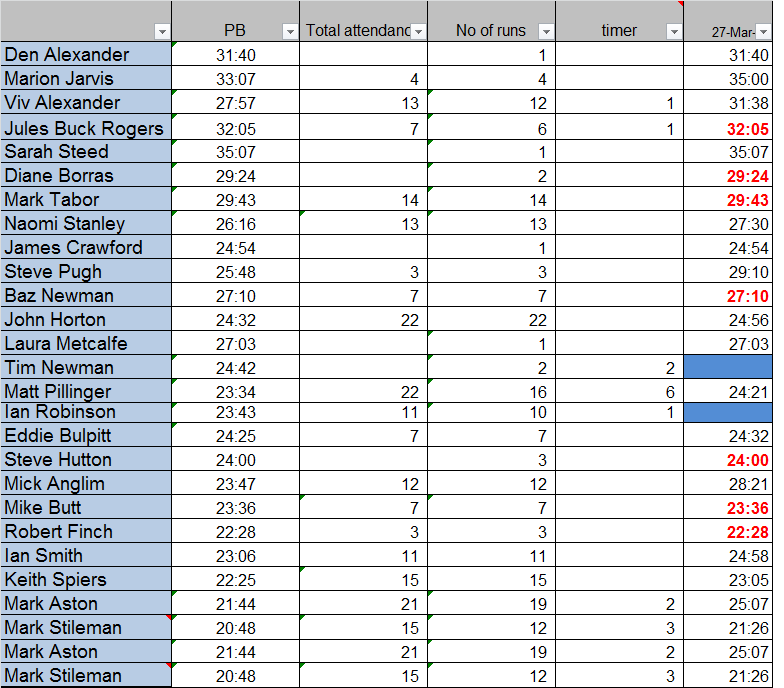 Of the 23 runners, we had 3 first timers, so a big welcome to Den Alexander, Sarah Steed and Laura Metcalf – the handicap is run in the last week of every month, on alternating days. 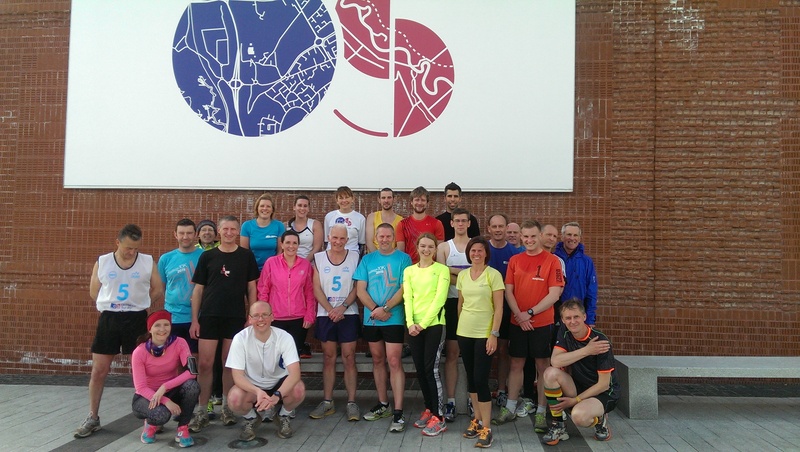 We also had a very impressive 7 personal bests, from Jules, Diane, Mark T, Baz, Steve H, Mike and Rob. It is particularly worth mentioning Mark (who has spent about 4 years trying to get under 30:00 and finally achieved it today) and Baz (who has now recorded a hat-trick of PB’s in the last 3 handicaps) . I would like to extend my thanks, on behalf of all todays runners to Tim Newman and Ian Robinson, who started us all at the correct times and recorded everyones finishing times. You will see from the above chart that John and myself are currently level in terms of total handicaps completed/timed, on 22. Mark Aston currently leads the way in current consecutive attendances, with a run stretching back to last August, while Ian Smith hasn’t missed an event since last September – both very impressive. The next handicap will be on Tuesday 28th April and I will send round an invite closer to the time. Finally, I have a collection of photo’s from the event, which I have shown a selection below.